It just keeps getting worse. The newest, worstest proposal for the Ti Cat Stadium is in the running yet. I am keeping it simple. There are many complex questions that need to be answered in the city’s report. I am simplifying things as much as possible. 1) We are not building a Pan Am Stadium. Pan Am Athletics for Hamilton is long gone. We are building a stadium for the Tiger Cats. 2) If we are gonna spend the money connect it to GO so that the parking spaces can be used every day. 3) If we are gonna spend the money plan it intimately with the proposed 1 billion dollar rapid transit plan. 4) I did not elect either Scott Mitchell or Bob Young. 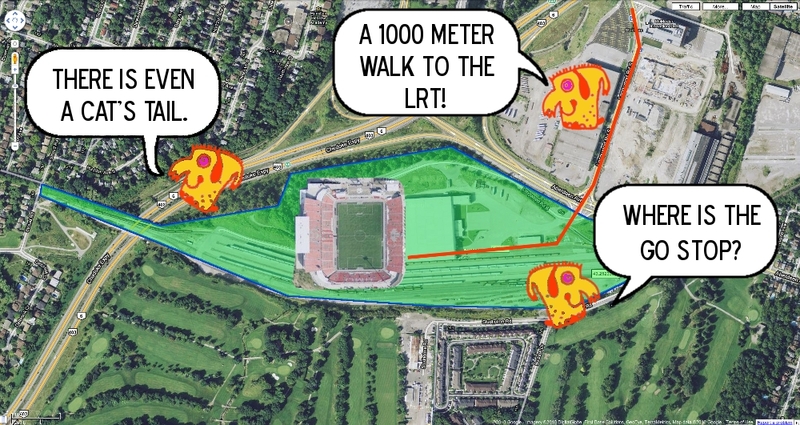 Present Tiger Cat Stadium does not have either GO connection or decent LRT proximity. But it does have a neat tail. Click on image to enlarge, and possibly enrage.